Centre Outsourcing Market Report below. The Frost IQ (Industry Quotient) report is a Buyer’s Guide that aims to provide critical insights on the Australian contact centre outsourcing market. The Frost IQ Matrix is used to develop a balanced assessment of the leading industry participants. 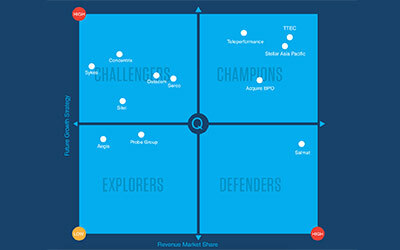 The matrix comprises a mix of quantitative and qualitative evaluations of the top 12 vendors in the Australian contact centre outsourcing market and categorises them into four quadrants - Challengers, Champions, Explorers, and Defenders. TTEC achieved a ‘Champion’ rating. To download your copy of the Frost IQ: Australian Contact Centre Outsourcing Market, please fill out the form below.